Abstract: Pursuing “truth, kindness and beauty” is an important characteristic and value orientation of traditional Chinese culture. Chinese Wushu is conducive to the cultivation of the participants’ “truth pursuing” spirit, the ac-complishment of the participants’ “kindness pursuing” morality, and the improvement of the participants’ “beauty pursing” state. 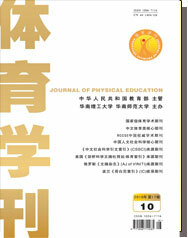 Having entered into the new era, education in China reawakening such a fundamental education task of Chinese Wushu as serving “moral establishment and student cultivation” in the new era, and regaining such a student education value of Chinese Wushu as pursuing “truth, kindness and beauty”, not only can realize the respon-sibility and mission of schools of various types at various levels to inherit excellent traditional Chinese culture, but also is the vigorous practicing of the following instruction given by General Secretary XI Jin-ping: guide students to cherish learning time, to learn knowledge without distractions, and to develop toward the directions of pursuing truth, understanding reasons, and being sensible.